Before there was every kind of outdoor reality show on television, there was Survivorman, a show about a man in the woods with nothing but a multi-tool. What makes the show starring the Canadian survivalist Les Stroud even more intriguing, and still does, is the fact that Stroud films everything himself. 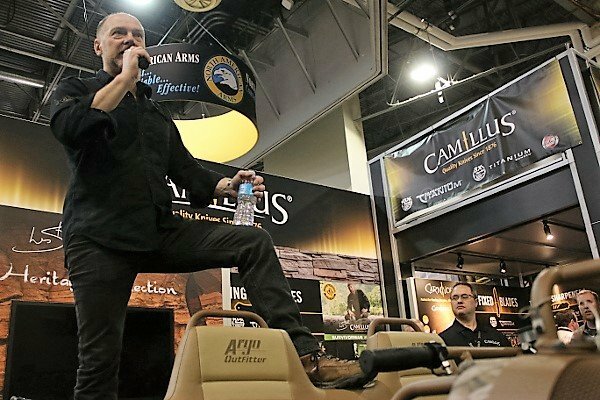 Stroud attended the 2016 SHOT Show recently in Las Vegas at the Camillus Knives booth surrounded by his series of signature knives and survival gear. He spoke with the crowd there about his biggest challenges, most feared encounters and Survivorman’s next season. Survivorman, now airing on Science Channel, is heading into its 8th season this year. Taking him to the world’s harshest climates among the fiercest predators, Stroud has seen nearly everything the planet has to offer from the frigid arctic to the Sahara desert. So what is his most feared animal? Last year in India, Stroud survived in an area he later found out was home to a tiger that had already killed 21 people. It was before his days on Survivorman when he had a terrifying encounter with a moose that sent him scurrying up a tree. The moosed huffed and buffed, rustling branches and trees below before Stroud eventually scampered away to safety. Then there was a jaguar in an early season episode of the show. Something that sets Survivorman apart is the raw nature of each episode. Nothing is staged or recreated. Everything is filmed as it happens. Next season look for Stroud to carry 4K video cameras and possibly virtual 3D. Stroud is also known as a world class harmonica player, which he said he got serious about in college. He was recently honored to play with Alice Cooper and Robbie Krieger at a show in Phoenix. At one point, he said he used to run 10 miles a day with a harmonica in his mouth just to build up the lung power. “It’s something I really fell in with,” he said.